The Students won all but one game at the venue on their way to lifting the First Division trophy last season and have come into a decent run of form in the top flight as they go into tonight’s match unbeaten in three home fixtures. That run included impressive victories over Finn Harps (3-0) and Waterford (4-1) plus a credible 1-1 draw against St Patrick’s Athletic. 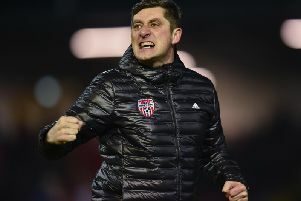 Tonight’s visit of an in-form Derry City side who defeated UCD 3-0 on the opening night of the season, will provide a stern test but O’Neill expects a much closer contest this time around. “I suppose you could expect a different game as we’ve grown into the league a little bit better,” said the UCD supremo. “Our confidence has improved. We had a good win last week but Derry were still by far the better side in the first game of the season. Declan Devine is preparing his side for a tough environment in front of a paltry support and O’Neill agrees the lack of atmosphere could play into his hands. “It’s not often you can say having no fans is an advantage,” he laughed. “But it can be tough for teams who are used to having an atmosphere and a bit of noise during the game. It’s mentally tough for other teams who come to play against us. “Last year when we won the First Division our form in the Bowl was very, very good. We only lost one game there in the whole of last season. O’Neill, who encourages an attractive brand of football from his young side, has been impressed by the team Devine has assembled and by their desire to win. 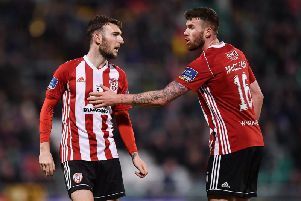 “What has been really notable about the Derry team this year is their desire to go and win games. They played some really good football against Sligo and dominated them. I watched that video back two days ago. “Last week’s performance was impressive as they showed the other side by playing good football as well as showing they can roll up their sleeves to win a battle. “Those games against Finn Harps, it never really comes down to footballing quality it comes down to whoever wants to win it more. “From my own perspective I do hope it’s going to be a bit closer of a contest but I hope it’s a good game to watch because it’s two teams who try to play football the right way. There’s good quality in that Derry side. O’Neill has received both plaudits and criticism for sticking with an expansive brand of football in the top flight. And he insists he won’t change his philosophy. “It’s what won us the First Division last year and it’s the style of play the players’ want to play. It’s what we enjoy to do. From my point of view it’s easy to manage. Although we get some plaudits, we still get some negative comments thrown our way saying we’re too open or too expansive and the reason we haven’t been winning games is because of our style of play.